On Sunday, March 8, the Loser’s Bracket Finals at the Halo Championship Series Season 1 Finals took place between Counter Logic Gaming and Noble Black. What ensued was completely unexpected, and what many fans call one of the greatest matches of Halo ever played. 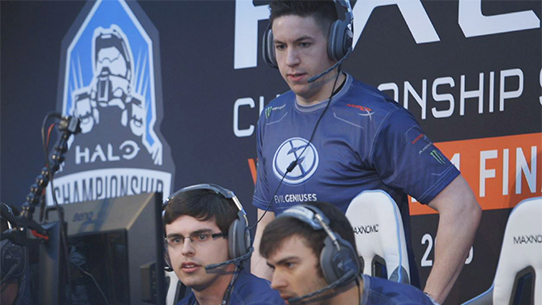 The full match is available for viewing on Halo Channel now, and also here on Twitch. We caught up with Heinz, who played for CLG, and Arkanum, who played for Noble Black, in an interview conducted via Skype on March 13, to recount the epic series. HCS: Have you guys gone back to watch the VoD from the tiebreakers yet? Or is it just too much to handle? Arkanum: At first it was too much to handle. It was a heart breaking loss but when I got home I instantly went back and watched ALL of our VoD and watched the whole CLG series about four times to figure out how to improve. Heinz: I haven’t gone back and watched yet. I will soon because I’m sure there are things to learn from it and I’d like to try and gather it in from a spectator’s point of view because although the time kept running out, to me, it all happened so fast. HCS: Describe your feelings going into Game 5. Heinz, you were down 0-2 and brought it all the way back to 2-2. Arkanum, you were up 2-0 and let the lead slip. Heinz: We were very confident the whole series. We had played them at Gamers For Giving 2015 and won pretty solidly I’d say. Even when we were down 2-0, we let the lead slip away both games so we knew we were playing well. We just had to stay disciplined throughout the entirety of the game and we were confident we would pull off the comeback. Game 5 took on a life of its own. HCS: After the first 32-32 Slayer tie, and with tensions so high, how do you get you and your team psyched up again to play the 5-minute replay? Heinz: There was no extra motivation needed. We were playing to advance for a chance to win the Season 1 Finals. That should say it all! The finals were where we belonged and we made it happen event in and event out. Arkanum: I told them no matter what we were still in the tournament and could still pull out the win. Forget the past and just believe in each other fully. One play at a time, one game at a time, and one series at a time. Then I looked over to APG and said "Brad, I believe in you. We are winning this tournament." We were all already motivated as hell and hungry. Even though we didn't win my confidence hasn't dropped, instead it's increased and I still feel the same if even hungrier now. 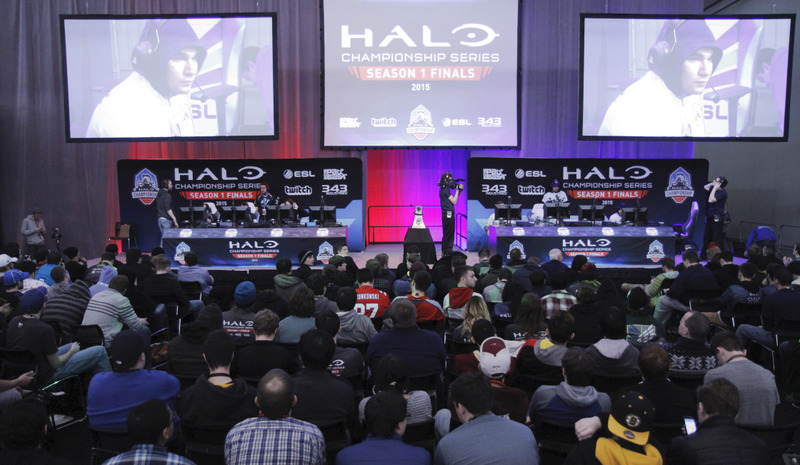 HCS: How aware were you guys of the huge crowd that had gathered to watch? Heinz: It was pretty noticeable after one of the overtimes. The roar from the crowd got louder and louder as each overtime dwindled down and we ended up tying time after time (laughs). It was almost a novelty by the time we pulled through. It reminded me of rivalry matches back in Halo 3 with Triggers Down and Str8 Rippin. HCS: With 5-minute gametypes, how does playing with so much pressure effect how you play? Every single kill or death could mean winning or losing. How does that effect your decision making? Heinz: The pressure is something we are all accustomed to - playing on main stage for a chance to win an event or go to the finals; my whole team has been there before. As for the 5-minute overtimes, it definitely changed the way you played because with time running low instantly, every kill was amplified. You were doing your best just to stay alive, as opposed to being aggressive with your team. Arkanum: It's nerve-wracking and very stressful, but when you want to win so bad you keep your cool. It definitely makes you afraid to give up a death and makes you want to play as passive-aggressive (more passive I'd say) as possible. Which I feel was part of why we lost, we had opportunities to be very aggressive and takeover but wanted to play safe. Pressure is something we, as Halo pros, are used to so if anything it helps us hit the shots that matter most and make even more clutch plays which I'm sure Heinz here can attest to. HCS: How did your opening strategies change from replay to replay? What did you notice from the other team and tweak? Heinz: We had a beginning strategy that worked in the opening game and the opening OT, but we figured we would need to adjust it after that because we knew they would try and counter it. In between each game, we were trying to communicate to each other the ideal start based on what we thought Noble Black would do. It became different a few times with PJ (Snakebite) and I even at one point debating whether or not if I should boost him up to ring 3 right at the beginning of the game. We ended up not doing that and kept it relatively similar, which led to us losing rockets in the last couple of OTs. HCS: Ring 3 boosting at the beginning of the game? That's such a huge risk to take. Heinz: That’s the word I kept using to Snakebite - risk, and he was pretty good at the jump, but wasn’t sure he could do it every time, so we decided not to do it. I agreed with him that it was very risky. Arkanum: APG usually grabs snipe, he asked me if I wanted it and so I picked it up each replay instead. We kept slightly modifying where we would run or look. We were really just trying to read what they were most apt to do and try to catch them when they were open, which didn't happen much. Primarily everything was based around trying to win that Rocket fight at the beginning. I'd say we kept similar starts most of the time as well. I knew they were going to go Ring 3 as often as they did and when they did it. I wanted to do some risky starts and plays of my own which I felt we could pull off, but same with Snakebite to Heinz my teammates thought it was too risky, and I don't disagree but judging by what they (CLG) were doing I felt we could pull it off. HCS: With the chaos of the matches, were you guys aware of the score up until the last moment? Heinz: You’re very aware of the score, especially in the closing seconds. Not only were the first 3 OTs ties, but they were tied in the last 10 seconds, so your thought-process instantly in those last few moments are staying alive (as we are all yelling at each other what to do). Arkanum: I'd agree with Richie (Heinz). I'd also say even with that awareness we had no idea most of the time that it would be a tie. Maybe one game where we forced the tie so as to stay in it, but there's just no way to know in those situations it's going to be a tie you just do your best to either stay alive or get a clutch kill, or both if possible. There were times we were sure we were going to close out and win as I am sure CLG thought themselves. HCS: Did you ever stop to think about just how crazy the series was? What the viewers must be thinking? Heinz: The crowd spoke for themselves after each tie. I would look and see jaws dropped everywhere, people in disbelief. It was pretty cool and I thought it was nice to see all the interest in Halo once again. Arkanum: When the match was going on those things crossed my mind but I would push them back and focus on trying to win. I wanted to win so bad, so I made sure I only focused on the match at hand. It's pretty awesome, though being a part of something so legendary. HCS: Arkanum, you had the Sniper Rifle for multiple replays. What angles were you looking for? Heinz, where were you guys expecting the sniper to be? Arkanum: I was looking for picks from Ring 3 and hoping their Sniper would try to cross around their grenades to Flag from Turret. I primarily wanted Ring 3 because I knew they'd be there often and I had an idea of when they would jump. I had poor timing during a few moment, but I did hit several of the shots that I needed to. Looking back, I would've changed my angles quite a bit. I rarely get the Snipers so I admit my angle choices aren't as good as I'd like. I'll be working on that though, other things. Heinz: My goal was to go for Rockets at the beginning of the game. I kept getting outnumbered as we changed our strategy up a bit, and it got me killed in a couple of the replays. Once that happened and Noble had Rockets we had to play for picks (wait for Royal 2 to get a snipe), and other than that, Tom (OGRE 2) and I tried to stay alive while I boosted Snakebite to Ring 3 multiple times. You had to play it very slow and cautiously, not always how you want to play. HCS: Talk about the headshot Royal 2 hit to tie the third Shrine Slayer 10-10, and send the series into another replay. Heinz, did you guys think it was all over before he hit that shot? Arkanum, did you think that you guys had won it finally? Heinz: When Royal 2 has a Sniper, you never count yourself out. He clutched it a few times in the last few seconds for us, but you never think it’s over until the score is final (like our Warlord King game vs. Denial). Arkanum: I misunderstood the situation. I had thought one of my teammates were one shot and at risk of dying and being pushed. I spawned behind them and saw OGRE 2 in the open and tried to kill him. I had seen one of my teammates around Blue Turret Ramp, and was hoping he would go to Flag when we backed down Royal 2, so that we could pick off OGRE 2 and close out the game. I didn't expect Royal 2 to jump out and honestly I should've just hid. I was unaware of the time remaining. I do believe OGRE 2 should've died after like six shots to the back of the head but that's beside the point. Arkanum: From experience teaming with Mat (Royal 2) and watching him, I can agree that you never count yourself out when he has a snipe (laughs). HCS: Arkanum, is that the one moment you wish you could do over? Arkanum: Absolutely. I blame myself a bit for that. I am usually very good at reading situations like that clearly -- being aware of everything and anything. It was a bad time to misunderstand the situation. HCS:Let's talk about the match where Heinz respawned behind enemy lines. Heinz, you were so patient. What was the trigger for you? What was the thing you were waiting to see before you came out of hiding to fight? Arkanum, what did you think when your team spotted Heinz in your base? Arkanum: When I saw Heinz, I was surprised and I had known we messed up. We opened up that spawn and knew someone could spawn there, but just wasn't aware of it enough. I believe we called out that our back rocks spawn was opened as well, but at the same time it was a fairly lucky/unlucky spawn for him. Heinz: I was told to hide, which was fine, but I wanted to organize a push around me getting a spawn like that. The only way I would have just pushed out on my own, is if I saw Jacob (Arkanum) lingering around on Flag and I could’ve killed him. There was a time where I saw them trying to boost each other ring 3, and was as convinced as I could be that they saw me. I let my teammates know, but Noble never pushed for me so it was a false alarm. I later saw APG outside of their bon, but if I were to shoot him, he would’ve gone into ring before I could kill him and blow my cover for nothing. I was communicating to my team how wide open rocks were and I even had Mat go Carbine with the Sniper, but I still think we could’ve made better use of the situation by getting them distracted, and then me flanking behind them as they were looking Carbine/Rocks. I ended up dying because as I finally decided to push out, someone on my team died and they naturally were looking for the guy to spawn behind them, and there I was unfortunately, like a deer in the headlights. HCS: Very unfortunate indeed. Talk about when the series finally ended. What were both of your emotions at that moment? Heinz: I just had to laugh. It was crazy at that point. We were happy that we won and relieved it was over, but we knew we still had work to do. It was a lot of fun to be a part of that with Noble and will definitely go down as one of the greatest Halo series ever. Arkanum: Heart broken, disappointed, angry (not at anyone - just hate losing), and empty because we were so close. An array of negative emotions. To sum it up, I was sad (laughs) but as time went on I saw things more positively and optimistically. I was proud of my team and myself. Appreciated the love and support from everyone that watched. I felt a sense of accomplishment to have been involved in something so legendary. I agree with Heinz, I don't see a series like that happening for a long time. Definitely one of the greatest Halo series ever. 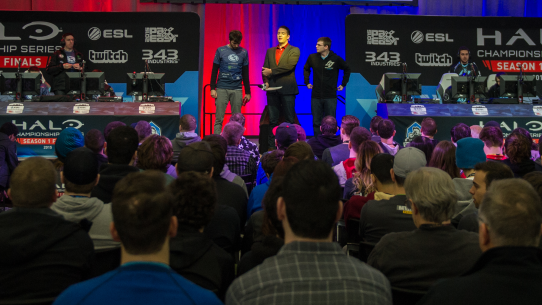 HCS: Many fans are saying it's the greatest match of Halo ever played. Arkanum: I'd have to say I agree with them (laughs) and am happy they enjoyed it. It truly was so fun. Heinz: It’s weird because I was hearing it about our series vs. Denial the day before. I remember Lethul telling me if Game 5 of that series was closer, that would’ve been one of the best series also. People always tell me about Triggers Down vs. Str8 Rippin at Anaheim 2009, which was a great series, but I’m not sure. This Noble series was pretty good. They’re both close in my book. It’s really cool to have been a part of some epic series throughout the years. HCS: Thanks for taking the time to do this interview. Is there anything you'd like to leave us with? Heinz: Thank you to my family for being there with me and supporting me throughout my career. Shoutout to CLG and their fans - it was a great run this past season and I’m glad we could bring you a victory and entertainment. Also, shoutout to Denial for giving me a chance to represent your organization in Season 2 and last but not least, shoutout to my stream viewers. Love you guys. Arkanum: I’d like to say thanks to my parents and the rest of my family that supports me in doing this, especially glad my pops got to experience what competitive Halo is really like (he is hooked). I'd definitely love to shout out my teammates! Special shoutout to my buddy Quinn (Willikers) since I owe him one. Excited to go into Season 2. Shout out to Noble and all of our sponsors! Finally, a big thanks to all of our fans and supporters. All the people that gave us love before, at, and after PAX. I thank you all so much. Not only do I enjoy doing this for myself, but I do it for all of you -- you all inspire me to keep grinding and supporting Halo. Thank you so much. Much love! HCS: Thank you, gentlemen! Best of luck in Season 2. Heinz: Thanks! I’d like to add in a thank you to ESL and Halo for putting on a well-run show and just a very welcoming atmosphere. Thank you. Arkanum: Add that for me as well! You guys do so much and deserve a ton of credit. HCS: Thanks for putting on an amazing show! 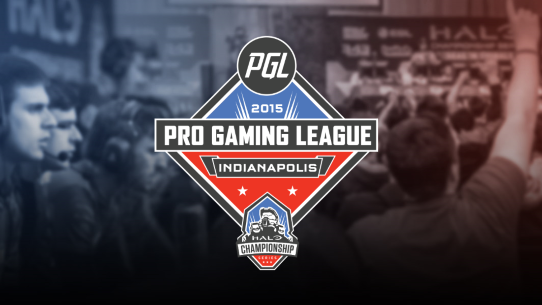 In exactly three weeks, we’ll be at HCS Indianapolis at Indy PopCon 2015 for the final open tournament in Season 2, and we hope you’ll join us! We have some exciting news to drop for those thinking about competing, as well those watching in-person and from home. Let’s get right into it.